Since I have a rather large dinner planned, I wanted something light for lunch. This dish is full of flavor...spicy, sweet, tart, salty...but not heavy in the belly. And good for noshing while watching the first season of Dexter. Saute onion in olive oil--over medium heat--just until slighly softened. Season with a pinch of salt & pepper. Add ground beef & cook until browned. Turn heat to medium-low. Add garlic & ginger, cook 1-2 minutes. Add chili paste, cook until melted. 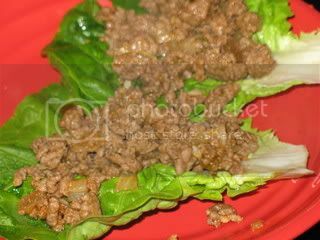 Serve filling on lettuce leaves. Go ahead and pop open a cold beer, too. It is your day off, after all.